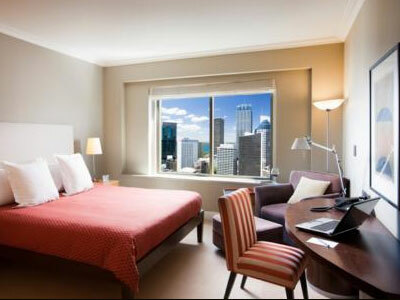 Located on Jamison Street in the northern end of Sydney’s CBD, Amora Jamison is an award winning five star hotel offering a great ambience, location and services for both business travellers and holiday visitors to Sydney. 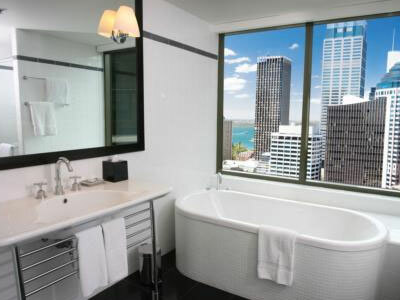 This luxurious and contemporary hotel is minutes away from the Sydney Harbour Bridge and the Sydney Opera House not to mention the buzz of Circular Quay or the charm of the Rocks - all close by the hotel. With cityscape views and excellent facilities it’s easy to see how this property was a finalist for superior hotel of the year and placed 4th in the Asia Pacific Travel and Leisure magazines: World Best Hotels Awards. There are 415 guest rooms ranging in types from: deluxe king or double rooms, deluxe corner king rooms and deluxe park suites; through to Jamison club twin and Jamison Club king rooms, Jamison Club Park Suites and Jamison Club Executive Suites. Jamison Club is an exclusive lounge that provides its members with special bonuses and privileges. Jamison Club rooms are located between the 30th and 34th floor of the hotel and along with improved accommodations, give its members a whole range of added bonuses. 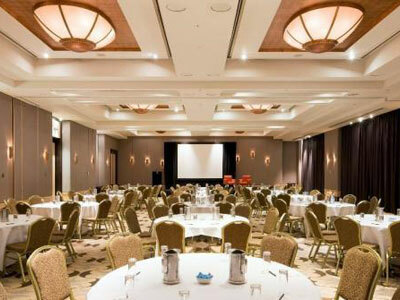 These include a deluxe continental buffet breakfast between 6.30am and 10.30am in the Jamison Executive Club Lounge, evening drinks and canapés between 5:30pm and 7:30pm, all day access to the Club Lounge including light refreshments, a complimentary clothes pressing of one garment (business style cotton shirt or blouse) per day. As well as complimentary in room broadband access, one hour access to the Jamison Executive Club Lounge boardroom and a selection of local and national magazines, books and newspapers. All of Amora Jamison Hotel’s room types come with luxurious furnishings, marble bathrooms with bathrobes and the latest in room entertainment. 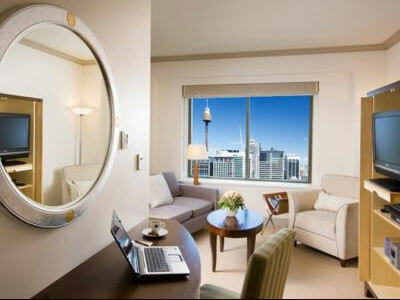 Reverse cycle air conditioning, international direct dial telephones, personal safes, workspace desk and data ports plus all the standard hotel amenities such as tea and coffee making facilities and a hairdryer. 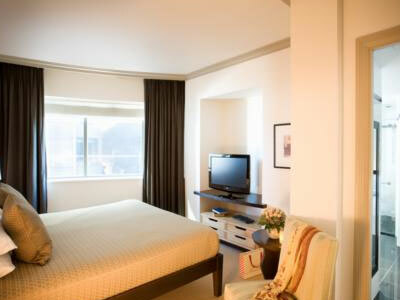 All rooms have city views, broadband access available throughout the hotel and complimentary bathroom products. Hotel facilities include 24 hour reception, 24 hour room service, currency exchange, laundry and dry cleaning services plus security valet parking, express check in and check out and an on-call Doctor and Dentist service. There is a state-of-the-art business centre on-site, full porter services and a babysitting service available as well. Guests are also encouraged to use the gymnasium including spa, sauna and steam room but if you want to be pampered then why not head to the Amora Spa and indulge in some therapeutic relaxation? Feeling hungry? 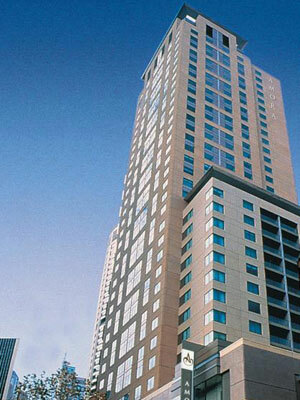 Amora Jamison Hotel has two restaurants as well as two bars to choose from. 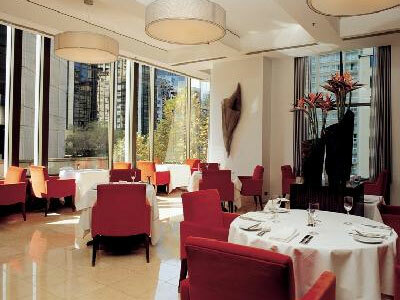 Charr, located on level one serves modern Australian cuisine specialising in prime aged steaks and fresh seafood. The Gallery Restaurant and Bar is the hotels second restaurant serving breakfast, lunch and dinner seven days a week. Seafood delights on Saturday nights is extremely popular and with an extensive buffet featuring Sydney oysters, Crystal Bay prawns, Balmain bugs and lots more it’s easy to see why. There is also the Inbargo Bar which has a wonderful selection of cocktails and bar food, great for catching the game on the wide screen TV. Secure onsite parking is available for a flat rate per 24 hours, subject to availability and cannot be pre booked. Valet parking is also available at extra cost. - Configured with a King Bed. - Configured with 2 Singles Beds. - Configured with King Bed.